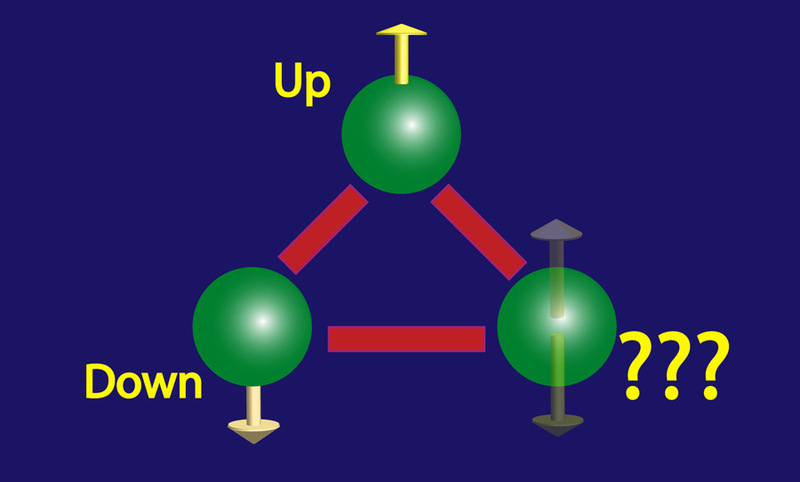 Figure 1: Simple frustrated system. “Frustrated" ensembles of interacting components – that is, those which cannot settle into a state that minimizes each interaction – may be the key to understanding a host of puzzling phenomena that affect systems from neural networks and social structures to protein folding and magnetism. Frustration has typically been extremely difficult to study because even systems with relatively few components have interactions so complex that they cannot be modeled effectively on the best conventional electronic computers. Now, however, a team of researchers has simulated frustration in the smallest possible quantum system in a precisely controllable experimental arrangement, one which can be extended to much larger systems. In addition, they demonstrated for the first time how frustration is related to a bizarre but highly useful quantum-mechanical condition called entanglement. They trapped three atoms of ytterbium, a metallic element a little lighter than gold, in a vacuum chamber and aligned them so that the atoms lined up side by side like beads on a string. Any three-object quantum system of this kind, in which each object can only be in one or the other of two states, will have eight possible variations. For example, three coins flipped simultaneously can yield all heads, all tails or six different combinations in between. The goal of the JQI researchers was to find out what set of conditions produced each of those eight combinations on demand. They did it by aiming two separate laser beams (traveling at right angles to one another) which intersected at the point where they hit the atoms. One beam consisted of a single frequency; the other had two additional frequencies superimposed on the laser carrier beam. Where the beams intersected, the various frequencies would alternately cancel and reinforce one another, creating a pattern of multiple "beat notes.“ These beat notes had two effects on the atoms, occurring simultaneously. One produced the equivalent of a magnetic field, which could cause the atoms' spins to flip – that is, to switch from north pole up to south pole up. The other beat notes, in combination, gave each atom a motional "kick," the effect of which was different depending on each atom’s spin state. Because each atom influences its neighbors' spins according to their proximity, the kicks provided a second set of controls on the system. By carefully tuning the relative strengths of the laser beams and the time intervals over which they were applied, the researchers learned how to produce any particular pattern of spins.